Babyballet business partners Kate Markham and Jo-Anne Torre. Two mothers are bringing the UK’s leading pre-school dance academy, babyballet, to North Tyneside. Kate Markham and Jo-Anne Torre will open the school in Whitley Bay next month. It will be the first babyballet school in the North East, and a personal triumph for the two best friends. Jo-Anne, from Whitley Bay, said: “I’ve followed babyballet for years and can’t wait to get started. The pair say it was dance that brought them together and helped them through some tough times. Kate’s world fell apart seven years ago when her husband died suddenly aged 36, leaving her to bring up her two daughters alone. It was around this time she met Jo-Anne, a former professional dancer who had given it up to be a mum to her four children. She started dancing again to help cope with acute post-traumatic stress disorder following a traumatic birth with her youngest son. Jo-Anne gave Kate’s oldest daughter, Lauren, one-to-one dance lessons and before long all of Lauren’s friends had joined her. A strong friendship was struck up when Jo-Anne returned to dance full-time and opened her own dance school, Decote Dance. Kate has supported Jo-Anne with the business side of the dance school set-up and introduced a software dance programme. “Dance is such a wonderful experience for youngsters, allowing them to express themselves in a fun and creative environment,” said Kate. “It also helps their confidence massively. I saw this first-hand with Lauren. She wishes that her late husband was here to see her start her own business, but says she knows he will be looking down on her, proud of what she has achieved. The two women are holding babyballet taster-classes on Saturday, from 10am to noon at Whitley Bay Young People’s Centre. The first babyballet classes start on Monday, September 4 at Whitley Bay Young Peoples Centre and The Tree House on Whitley Lodge. There is an introductory offer of £15 for a three-week- trial. 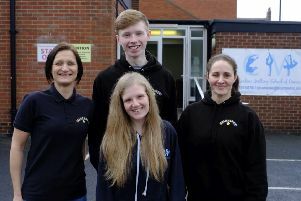 The two women have big plans for their new venture, which includes employing more dance teachers and expanding to other towns and cities in the North East.